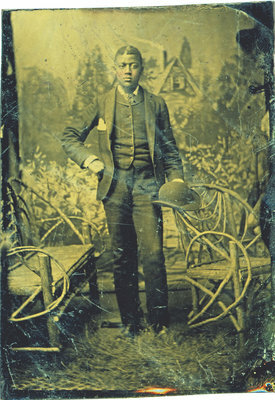 An unidentified man stands in the foreground of a painted landscape backdrop in this small black and white tintype photograph. The man's cheeks have been highlighted in red. The name of the photographer and the location of the studio are unknown. This tintype was in the possession of Iris Sloman Bell, of St. Catharines, Ontario. Relatives of the Sloman - Bell families are former Black slaves from the United States who settled in Canada. "Tintypes were the invention of Prof. Hamilton Smith of Ohio. They begin as thin sheets of iron, covered with a layer of black paint. This serves as the base for the same iodized collodion coating and silver nitrate bath used in the ambrotype process. First made in 1856, millions were produced well into the twentieth century. When tintypes were finished in the same sorts of mats and cases used for ambrotypes, it can be almost impossible to distinguish which process was used without removing the image to examine the substrate."